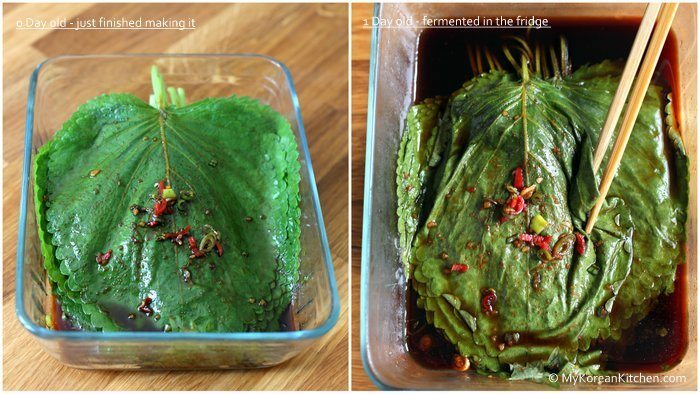 One of my favourite Korean banchan – pickled perilla leaves recipe! It’s so delicious and addictive! You will be hooked instantly! 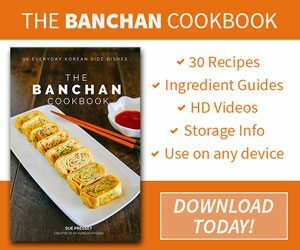 Today I would like to share one of the classic Korean side dishes (banchan, 반찬), which is also one of my favourite side dishes. 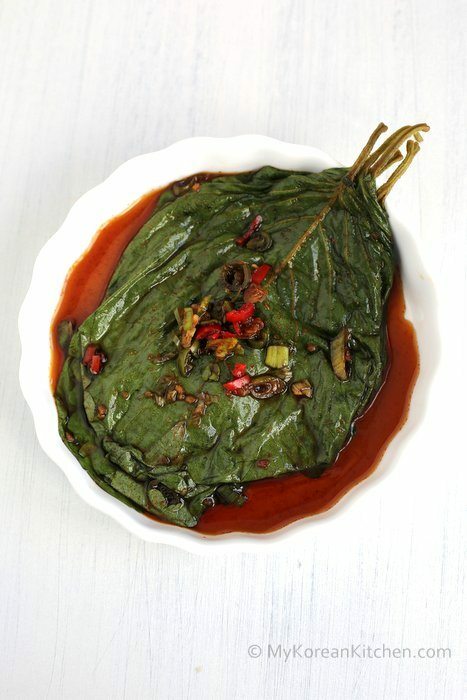 It’s Pickled Perilla Leaves (Kkaennip Jangajji, 깻잎 장아찌), also known as Perilla Kimchi (Kkaennip Kimchi, 깻잎 김치). These terms are used interchangebly on some occasions. Kkaennip Jangajji (깻잎 장아찌) has a salty, slightly sweet and garlicky taste and is mainly seasoned with soy sauce. 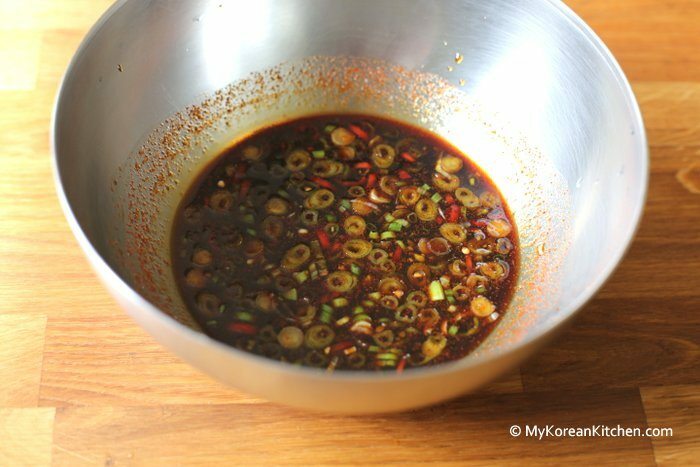 Kkaennip Kimchi (깻잎 김치), on the other hand, has a spicy and garlicky taste like Cabbage Kimchi and is mainly seasoned with Korean chili flakes (Gochugaru, 고추가루). 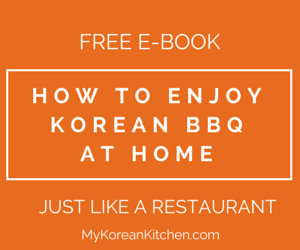 I personally prefer the former version (Jangajji) of pickle but I also shared the Perilla Kimchi recipe in my Banchan cookbook, for those of you like to pickle perilla that way. 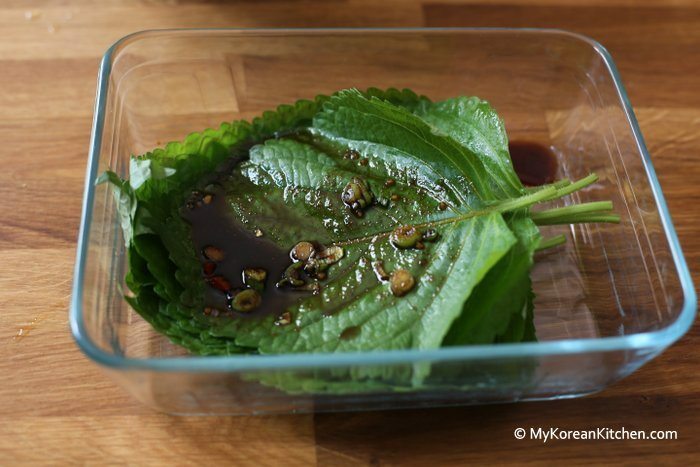 Pickled perilla leaves side dish is one of the easiest Korean side dishes you can make. Using my recipe, you can prepare it within 10 mins. Though, you will have to wait at least overnight for it to properly get seasoned. I recommend you to eat this with some rice as on its own it will be too salty. Most Koreans nickname this dish as a ‘rice stealer’ (Bap-Doduk, 밥-도둑), meaning you can consume rice easily and fast without you even knowing! I can totally relate to that! A bowl of rice just accompanied by this delicious, aromatic and addictive side dish. Yum! My mouth is watering again. 🙂 I hope you get to experience this and like it too! 1. 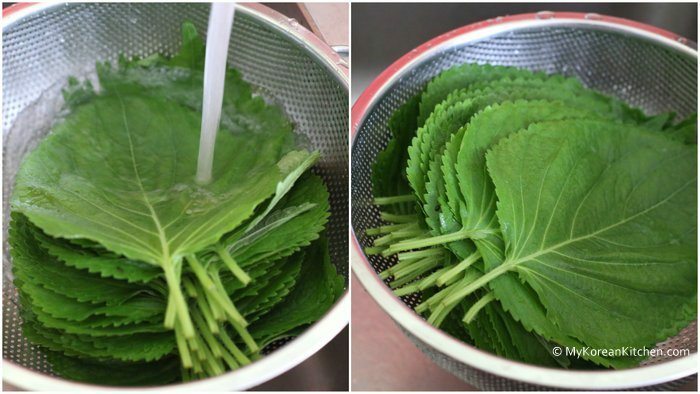 Rinse the perilla leaves in cold running water and drain/air dry them while left in the colander. 2. While waiting for the perilla leaves to dry, prepare the seasoning sauce. 3. Place the perilla leaves in stacks in a large (glass) container (with a lid). Spread (about 1 Tbsp worth of) seasoning sauce on top of the perilla leaf. Repeat this process for every 3 leaves for the rest of leaves. As it is already stacked, you will have to lift the leaves at every third interval with one hand while the other hand is spreading the sauce. You don’t need to spread the sauce on every leaf. If you have any sauce leftover, pour it onto the stacked leaves. 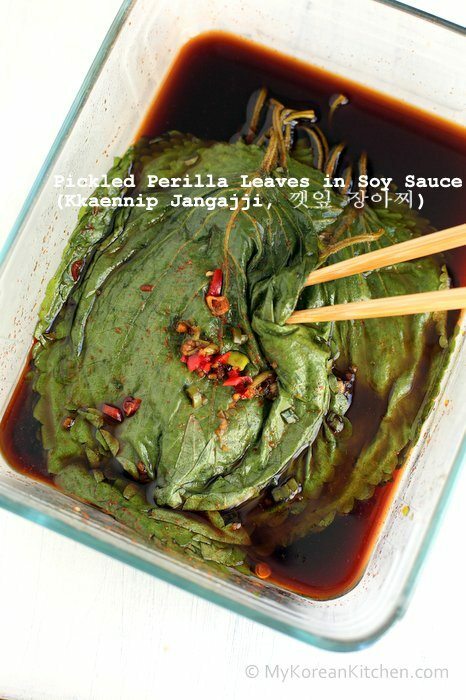 If you run out of sauce, tip the container and scoop out the sauce from the bottom corner of the container and spread it over the perilla leaves. 4. Close the lid and move the container to the fridge. You can start eating this from the next day. Serve it with a hot bowl of rice. 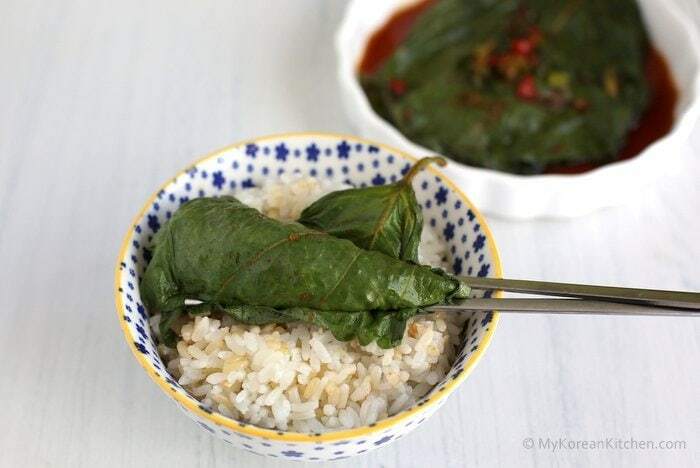 Pick up a piece of perilla leaf by the stem using your chopsticks, place it on top of your rice and wrap the rice with the perilla leaf. Rinse the perilla leaves in cold running water and drain/air dry them while left in the colander. While waiting for the perilla leaves to dry, prepare the seasoning sauce. Place the perilla leaves in stacks in a large (glass) container (with a lid). Spread (about 1 Tbsp worth of) seasoning sauce on top of the perilla leaf. Repeat this process for every 3 leaves for the rest of leaves. As it is already stacked, you will have to lift the leaves at every third interval with one hand while the other hand is spreading the sauce. You don’t need to spread the sauce on every leaf. If you have any sauce leftover, pour it onto the stacked leaves. 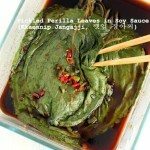 If you run out of sauce, tip the container and scoop out the sauce from the bottom corner of the container and spread it over the perilla leaves. Thanks for the recipe, Sue. My husband loves perilla and grows it in the garden, and wants to be able to eat the perilla leaf pickle through the winter – does this freeze? Or is there some other way to keep perilla, since you mention it being eaten through summer and winter? Hi Anne, I haven’t tried freezing the perilla pickles, but this is how some Koreans do. Divide the pickles into one meal serving size portion (in several batches) and pack them in zipper lock bags. Defrost before you serve them. Hope this works out! Manatee – I wonder if the purple leaves are actually beefsteak plant leaves. They are popular in Japan and are either green or purple but smaller than perilla leaves. They also have a very different flavour. Hi, I have a lot of purple perilla, do you think it will work just as well? How did you know I’ve been craving these?? 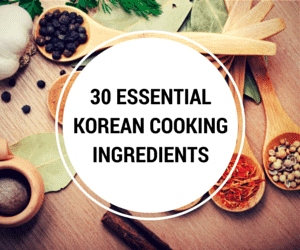 I wanted to get some at our tiny little Korean market but they only had the canned ones and I’ve never had those so I’m a bit apprehensive…once I go to the city I will see if they have fresh ones, thanks for the recipe!! Oh my! The pictures look so delicious I almost put my head through my computer screen to get to them! I have never eaten perilla leaves, but have fallen in love so with Korean food in the last few months that I am growing them in my garden. I can’t wait to try your recipes with them. Thanks so much! Though, when I was growing them in my garden, there were many holes on the leaves as other insects love them too much. :/ But enjoy my recipe! I hope you like it. I hope you enjoy this side dish Andra! These plants self seed. They grow everywhere in my garden and property. Almost invasive, but easy to pick or pull.